1. When is quantitative research useful? 2. How can you plan a quantitative research exercise? 3. What are the advantages of quantitative research? 4. What are the limitations of quantitative research? 5. What quantitative research methods can you use? Numbers are everywhere and drive our day-to-day lives. We take decisions based on numbers, both at work and in our personal lives. For example, an organization may rely on sales numbers to see if it’s succeeding or failing, and a group of friends planning a vacation may look at ticket prices to pick a place. In the social domain, numbers are just as important. They help identify what interventions are needed, whether ongoing projects are effective, and more. But how do organizations in the social domain get the numbers they need? This is where quantitative research comes in. Quantitative research is the process of collecting numerical data through standardized techniques, then applying statistical methods to derive insights from it. Conducting research soon? You can save your time and collect quality data by using mobile data collection tools. Try Collect to see how! When is quantitative research useful? The goal of quantitative research methods is to collect numerical data from a group of people, then generalize those results to a larger group of people to explain a phenomenon. Researchers generally use quantitative research when they want get objective, conclusive answers. For example, a chocolate brand may run a survey among a sample of their target group (teenagers in the United States) to check whether they like the taste of the chocolate. The result of this survey would reveal how all teenagers in the U.S. feel about the chocolate. Similarly, an organization running a project to improve a village’s literacy rate may look at how many people came to their program, how many people dropped out, and each person’s literacy score before and after the program. They can use these metrics to evaluate the overall success of their program. Unlike qualitative research, quantitative research is generally not used in the early stages of research for exploring a question or scoping out a problem. It is generally used to answer clear, pre-defined questions in the advanced stages of a research study. How can you plan a quantitative research exercise? Identify the research problem. An example would be, how well do New Delhi’s government schools ensure that students complete their education? Prepare the research questions that need to be answered to address the research problem. For example, what percentage of students drop out of government schools in New Delhi? Review existing literature on the research problem and questions to ensure that there is no duplication. If someone has already answered this, you can rely on their results. Develop a research plan. This includes identifying the target group, sample, and method of data collection; conducting data analysis; collating recommendations; and arriving at a conclusion. What are the advantages of quantitative research methods? Quantitative research methods provide an relatively conclusive answer to the research questions. When the data is collected and analyzed in accordance with standardized, reputable methodology, the results are usually trustworthy. With statistically significant sample sizes, the results can be generalized to an entire target group. Samples have to be carefully designed and chosen, else their results can’t be generalized. Learn how to choose the right sampling technique for your survey. What are the limitations of quantitative research methods? Does not account for people’s thoughts or perceptions about what you’re evaluating. Does not explore the “why” and “how” behind a phenomenon. What quantitative research methods can you use? This is the most common way to collect quantitative data. A questionnaire (also called a survey) is a series of questions, usually written on paper or a digital form. Researchers give the questionnaire to their sample, and each participant answers the questions. The questions are designed to gather data that will help researchers answer their research questions. Closed-ended multiple choice question and open-ended text question on Collect. Understanding closed and open-ended questions is crucial to designing a great survey and collecting high quality data. Learn more with our complete guide about when and how to use closed and open-ended questions. A good questionnaire should have clear language, correct grammar and spelling, and a clear objective. Questionnaires are often less time consuming than interviews or other in-person quantitative research methods. They’re a common, fairly simple way to collect data. They can be a cost-effective option for gathering data from a large sample. Responses may lack depth and provide limited information. Respondents may lose interest or quit if the questionnaire is long. Respondents may not understand all questions, which would lead to inaccurate responses. Response bias — a set of factors that lead participants answer a question incorrectly — can be deadly for data quality. Learn how it happens and how to avoid it. An interview for quantitative research involves verbal communication between the participant and researcher, whose goal is to gather numerical data. The interview can be conducted face-to-face or over the phone, and it can be structured or unstructured. In a structured interview, the researcher asks a fixed set of questions to every participant. The questions and their order are pre-decided by the researcher. The interview follows a formal pattern. Structured interviews are more cost efficient and can be less time consuming. In an unstructured interview, the researcher thinks of his/her questions as the interview proceeds. This type of interview is conversational in nature and can last a few hours. This type of interview allows the researcher to be flexible and ask questions depending on the participant’s responses. This quantitative research method can provide more in-depth information, since it allows researchers to delve deeper into a participant’s response. Interviews can provide more in-depth information. Interviews are more flexible than questionnaires, since interviewers can adapt their questions to each participant or ask follow-up questions. Interviewers can clarify participants’ questions, which will help them get clearer, more accurate data. Interviewing one person at a time can be time-consuming. Travel, interviewer salaries and other expenses can make interviews an expensive data collection tool. With unstructured interviews, it can be difficult to quantify some responses. One way to speed up interviews is to conduct them with multiple people at one time in a focus group discussion. Learn more about how to conduct a great FGD. Observation is a systematic way to collect data by observing people in natural situations or settings. Though it is mostly used for collecting qualitative data, observation can also be used to collect quantitative data. Observation can be simple or behavioral. Simple observations are usually numerical, like how many cars pass through a given intersection each hour or how many students are asleep during a class. Behavioral observation, on the other hand, observes and interprets people’s behavior, like how many cars are driving dangerously or how engaging a lecturer is. Simple observation can be a good way to collect numerical data. This can be done by pre-defining clear numerical variables that can be collected during observation — for example, what time employees leave the office. This data can be collected by observing employees over a period of time and recording when each person leaves. Observation is often an inexpensive way to collect data. Since researchers are recording the data themselves (rather than participants reporting the data), most of the collected data will generally be usable. Data collection can be stopped and started by researchers at any time, making it a flexible data collection tool. Researchers need to be extensively trained to undertake observation and record data correctly. Sometimes the environment or research may bias the data, like when participants know they’re being observed. If the situation to be observed sometimes doesn’t happen, researchers may waste a lot of time during data collection. Simple vs. behavioral is just one type of observation. Learn more about the 5 different types of observation and when you should use each to collect different types of data. Since quantitative research depends on numerical data, records (also known as external data) can provide critical information to answer research questions. Records are numbers and statistics that institutions use to track activities, like attendance in a school or the number of patients admitted in a hospital. For example, the Government of India conducts the Census every 10 years, which is a record of the country’s population. This data can be used by a researcher who is addressing a population-related research problem. The Census is one of India’s biggest, most important data sets. Learn more about how it was created, how it is conducted, and how it has developed over time with our three-part “Decoding Open Data” series. Records often include comprehensive data captured over a long period of time. Data collection time is minimal, since the data has already been collected and recorded by someone else. Records often only provide numerical data, not the reason or cause behind the data. Cleaning badly structured or formatted records can take a long time. If a record is incomplete or inaccurate, there is often no way to fix it. Checking external data for bad data can be a nightmare if you don’t know what to look for. Learn how to find and deal with problematic data points with our ebook, The Ultimate Guide to Basic Data Cleaning. Quantitative research methods are one of the best tools to identify a problem or phenomenon, how widespread it is, and how it is changing over time. After identifying a problem, quantitative research can also be used to come up with a trustworthy solution, identified using numerical data collected through standardized techniques. Collecting high quality data is the first step towards making better decisions through data. 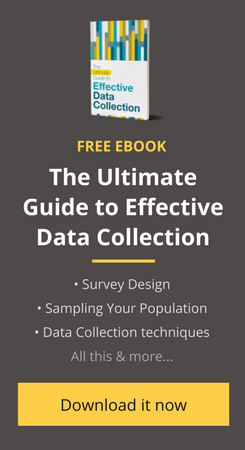 Learn how to design a stellar data collection plan with our 30-page ebook. Download it for free here. Image credits: Photos by Curtis MacNewton, Brijesh Nirmal, Charles Deluvio, and SocialCops. The text contains concise and important tips on data collection techniques. Nice book but I kind find a way to download it. Kindly let me know how to download it. Kindly tell me how to download the book. It is concise and practical as well as easy to understand. Very easy to read and informative book. Well written. Thany thanks for the download.